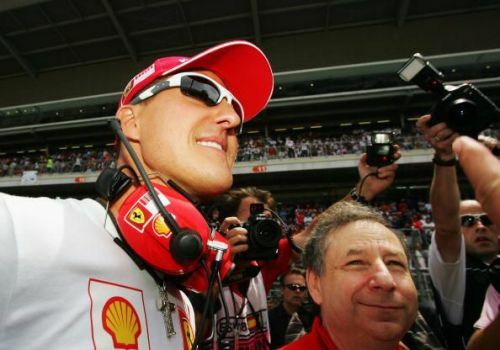 Jean Todt opened up on his equation with Michael Schumacher and here's what you need to know! Michael Schumacher is an emperor of Grand Prix racing. His name features among the indisputable greats of the sport. Together with drivers like Senna, Prost, Fangio, Michael Schumacher is considered among the top achievers in a sport that constantly flirts with mortality and tests one's limits, to the very edge. One wishes for the seven-time world champion to return to the state of normalcy. In the light of the terrible events of his 2013 skiing incident, one remains hooked on to any possible update surrounding the F1 legend's status: of health and fitness. One wonders, how might the world suddenly seem a normal space with an 'active' Michael Schumacher in it. Having said that, Michael Schumacher's enormous success wasn't on its own alone. A man critical to all the great feats 'Schumi' achieved was his former team boss at Ferrari, Jean Todt. Among the most respected men on the fraternity, someone who is as respected as he is successful, together with Schumacher, Jean Todt catapulted Ferrari to the absolute limit. A great relationship and one that fetched massive success for the Italian stable, Jean Todt continues to be good friends with Michael Schumacher in what can be called his 'darkest' or most 'difficult' days post his stellar F1 career. And recently, Jean Todt also threw light on his recent meet with Michael Schumacher and everyone was understandably curious as to what was it that the two would've exchanged among themselves. Speaking on this, Jean Todt explained his recent meet with Schumacher, one that was, understandably, marked with a 'lot of pain.' That is exactly how Todt explained his recent meet with the celebrated German driver, who's unfortunately in a vegetative state. He shared that everywhere where there's a Formula 1 following, Michael Schumacher's posters hang outside houses and apartments. Explaining the intricacy of their equation at Ferrari, Jean Todt also shared that the time he spent with Michael at Ferrari was the best time they had together in Formula 1. He also shared that the insights he shared with Michael and the respect they both enjoyed among themselves as one team at Ferrari were undoubtedly the biggest achievement of Jean Todt's career. Speaking of his time with Michael, Jean Todt shared that, "We love each other because we wrote an incredible story together." Michael Schumacher, in case, some of us didn't know, stays at Gland, a quaint town in Switzerland. Gland, not so far away from Germany, is where Michael's family and an elaborate team of medical experts are currently trying to aid the injured, convalescing F1 legend. And as far as Michael's equation goes with Jean Todt, the latter goes to visit the F1 driver, at least twice a month. Jean Todt recently received a lifetime achievement award from the German Magazine Auto Bild which is where he opened up on his closeness with Michael and shared that he's very much in constant touch with the former F1 world champion.